It's 7 Quick Takes Friday! Where I give to you in random order 7 funny things that happened to us this week. How did the last 7 days go for you? We survived our first week home with a new baby. In some ways, I've felt like we're doing pretty well. I've slept for more hours than I have fingers and I even cleaned junk out of my kids' craft cabinet. Not even realizing until someone pointed it out that we were sitting down to dinner with a trash can as a centerpiece on top of the table. Noticing there's a random can of tuna underneath my kid's car seat and I have no idea how it got there or long it's been there. I recently learned that I have license to do a lot more than I think I do. I was snacking on some chips, to which my 4-year-old was voraciously helping herself, and I told her she'd had enough. Of course I kept eating them (come on, I know you do it, too) and after observing me for a while she said, "But you can keep eating, because you're a mom and moms can do anything except kill people." I still need to think about all the implications of this. 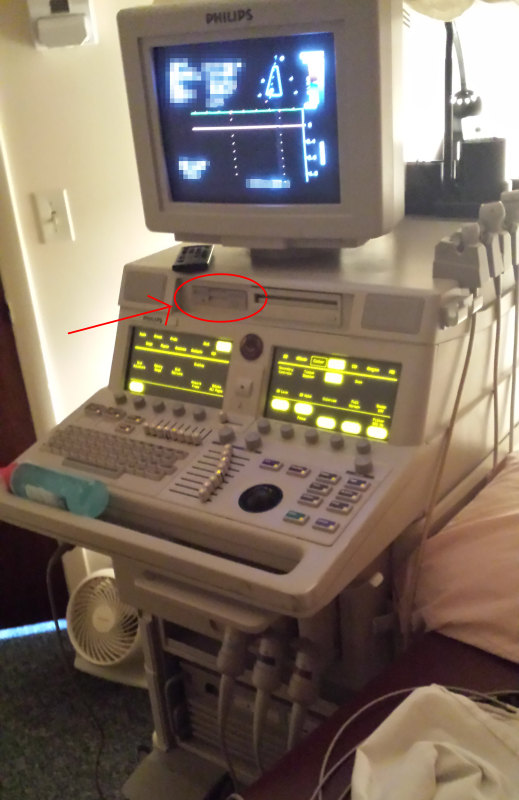 To get an ultrasound of his chest, they rolled in this ancient-looking machine. I mean ancient. It had space to insert your floppy disk, people. Needless to say, my son did not enjoy being unwrapped and stripped down to his diaper for the procedure. The tech kept trying to think of ways to keep him happier so she could continue with the ultrasound, asking "Does he want to eat? What does he want to do?" Well, what he wants to do is: not this. He's a newborn; his interests are nursing and pooping. If it doesn't involve those activities, it's safe to assume he doesn't want to do it. We weren't able to finish the complete ultrasound, but they got enough that they have a handle on what's going on. We go back in a year for another ultrasound... wait, are we really expecting it to go any better with a wiggly one-year-old? How was your Mother's Day? Mine was the standard breakfast in bed and homemade cards from the kids, which is just how I like it. This is what a self-guided preschool art project looks like. A while ago, I polled readers on the blog's Facebook page to see if getting a faceful of urine while changing a boy's diaper is a thing that actually happens in real life, or just in the movies. You see, I've been doing boy diapers for years and I've never been peed on. I guess I got cocky. While changing the baby's diaper I (regrettably) waited to put the new one on until I'd thrown the old one away, and in that instant he peed all over the bed. Really. It arced 3 feet up in the air and went everywhere. It ended up being a lot a laundry for 3 seconds' worth of poor decision-making. I was surprised to see this up there since I didn't know it had been accepted, but I was featured on Mamalode again this week for "Your First Pregnancy Versus Your Last Pregnancy." You know how things are all shiny and new during your first pregnancy, and then it loses its luster somewhere around your three millionth prenatal appointment? Go visit, read, and comment. Which ones can you relate to? "...forever release, acquit, discharge, and covenant to hold harmless the school and the town from any and all actions, causes of action, and claims on account of, or in any way growing out of, directly or indirectly, all known and unknown personal injuries or property damage which [name of student] and/or I may now or hereafter have as the parent of said minor and also claims or right of action for damages which said minor has or hereafter may acquire, before or after he/she has reached his/her majority resulting from his/her participation in the aforementioned activity." I read it out loud and my 12-year-old wanted to know why it didn't just say "It's not the school's fault if your kid gets hurt." I was wondering the same thing. #3 and #7 haha! Too funny. Sounds like you're doing great! Happy one week! Yes, but was the can of tuna open? I'm glad you made it through the first week! When I found out I was having a boy this time, changing a boy diaper instantly became one of my biggest fears. I mean, I've changed them before. I started babysitting my boy cousins at age 8, I have more nephews than I do nieces, but none of them peed on me. And my girls peed one me...I guess I have been worrying more about hurting the poor little guy and also having more laundry and stuff. That note from the school is hilarious! That ultrasound machine is crazy old. I wonder how it has continued to work well over the years. Maybe one of those cases where people used to make things that lasted and worked reliably? Eighteen years of raising girls - and my baby boy peed on me, my friend, and the bed when he was one day old. And P.S. - I'm so impressed you managed a 7QT a week after having a baby! My brain ACTUALLY HURTS from reading the permission slip. Way to go surviving the first week with the newborn! #7: lawyers apparently get paid per word. The first few nights were pretty scary. I was convinced I'd never sleep again. We're beginning to come to some sort of an agreement about how to spend the nighttime hours, though. I had to laugh at that one, too. And then I looked at the fine print to make sure there wasn't a clause about handing over my firstborn. They don't make things like they used to. The best microwave we ever had was this hideous monstrosity we picked up on Craigslist that was probably from the 1970s. Built like a tank and it lasted forever. Couldn't take it with us when we moved, though, because it was ginormous and weighed a ton. Thankfully, no. I guess it could be worse. Also, that release form is ridiculous. But I guess that just goes to show how many people sue over eeeeverything. Haha, the pee in the face is kind of a rite of passage event I think. It happened to me right off the bat, but since i have only 1 boy luckily we have not had that same event re enacted many times over. Congrats to you on your new baby! Congrats on your first week home with your newest little one! I can't believe you made it this long without being peed on. It was obviously time for it :). I had this displeasure quickly after my son was born. I had never changed a boy's diaper before and honestly didn't even think about that happening. Your 12 year old is very smart. I always wonder why those forms don't just cut to the chase as well. My son peed on me so many times. I was too tired to remember to cover it. That permission slip is crazy. My brother peed on me, too! (I don't have any boys...) Or at least he would have if my mom hadn't had the presence of mind to block it with her hand so it didn't get all over the *entire* cabinet. Yuck! Well, we've definitely been christened now. Or at least the bed has been. Mom reflexes are the best! A card my sister-in-law sent me sums it up: "Having a baby boy is no day at the beach ... But you WILL get wet!" "Oh, this microwave? Why, my great-grandpa built it to exchange for my great-grandma's hand in marriage, and it's been in the family ever since..."